Minnesota depends on small businesses to keep its economy thriving – and we need leaders like Jim Hagedorn in Congress to keep Main Street strong and our economy booming. As a lifelong Minnesotan, Jim Hagedorn has fought to keep our economy strong ­– and he understands the impact that excessive regulation can have on small businesses and Minnesota families. He is a fierce advocate for free enterprise and believes that reducing regulatory burdens, cutting taxes, and repealing ObamaCare will benefit small businesses and grow jobs in Minnesota. Jim Hagedorn is the fighter Minnesota needs in the U.S. House to roll back burdensome regulations and keep our economy thriving. On November 6, vote Jim Hagedorn for Congress. Jim Hagedorn was born in Blue Earth, Minnesota and was raised on his family’s farm near Truman, Minnesota. Hagedorn studied government and politics at George Mason University and later worked as a Legislative Assistant to U.S. Congressman Arlan Strangeland (MN-07). From 1991 to 1998, Jim served as the Director for Legislative and Public Affairs for the Financial Management Service, the U.S. Department of the Treasury agency responsible for the management of more than $2 trillion in federal funds. Later, he accepted a position as Congressional Affairs Offices for the Bureau of Engraving and Printing. Hagedorn states that his main platform is the economy. He believes that regulatory reform, corporate and individual tax reform, and repealing and replacing ObamaCare is the key to a healthy and growing economy. He states that he supports the Tax Cuts and Jobs Act and would advocate for its permanency in Congress. 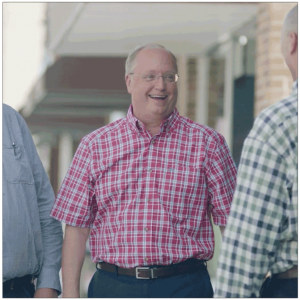 Hagedorn vigorously supports repealing the death tax, as he has seen firsthand its harmful effects on generational farms. Hagedorn also believes that burdensome EPA regulations are costly and unnecessary for farmers who already have every economic incentive to be good stewards of their land and supports eliminating those onerous regulations. Paid For By National Federation of Independent Business Federal Political Action Committee.